The decision of the Superior Court of Ontario in McAteer v. Canada (Attorney General), 2013 ONSC 5895, upholding the constitutionality of the reference to the Queen in the citizenship oath stresses the importance of the legal distinction between the Queen as a person, and the Queen as (a symbol of) an institution. Accordingly, those who have written about this distinction ― starting with Justice Morgan in McAteer ― have ventured a variety of more or less convoluted phrases to describe the former. [S]he was a Girl Guide when she was a tween, and she a mechanic during the Second World War, prior to become the monarch of various realms in 1952. She owns Balmoral Castle … She currently owns two corgis and the horse that she owns, Estimate, won the Royal Ascot this year. The pithier Steven Muerrens describes her as “an elderly lady with a unique wave” and “the woman who appears on our currency.” And I myself have written about “the kindly old lady whose portraits the federal government is obsessed with hanging all over the place” and “the physical person living in Buckingham palace” ― though that’s probably not a unique identifier. Can you do better than this? Although I really like the “elderly lady with a unique wave,” can you come up with a more entertaining way of describing Elizabeth R.? Oh, and here’s a picture, for inspiration ― not a great picture, but one I took myself. P.S. 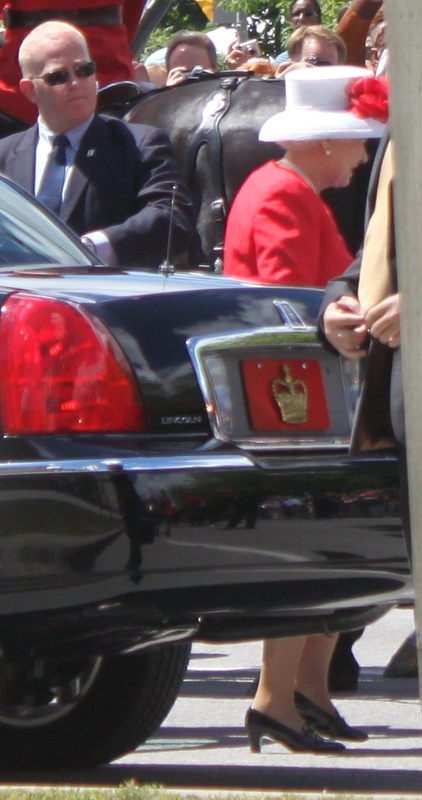 Whether you like the monarchy or not, you have to admit that the Queen has the most awesome license plate ever.